As the summer draws to a close, DCO scientists have unlocked mysteries about the origin of blue diamonds. 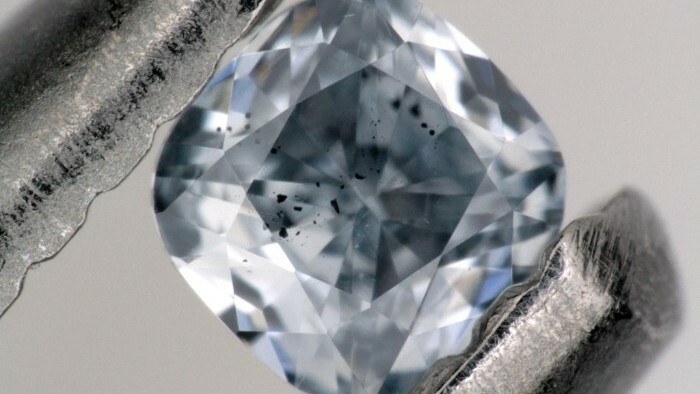 In a paper featured on the cover of Nature (2 August 2018), Evan Smith (Gemological Institute of America, USA), Steve Shirey (Carnegie Institution for Science, USA), Fabrizio Nestola (University of Padua, Italy), and colleagues report that blue diamonds are among the deepest samples of Earth’s interior ever found and shed new light on deep-mantle recycling of surface materials. Another DCO research group demonstrated that crystalline polymeric carbon dioxide (CO2-V) is stable at lower-mantle conditions. Roberto Bini (Universita di Firenze, Italy), Kamil Dziubek and Demetrio Scelta (European Laboratory for Non-linear Spectroscopy, Italy), along with colleagues at the University of Vienna and the European Synchrotron Radiation Facility suggest that the presence of crystalline CO2 phases at lower-mantle conditions could represent a carbon source for chemical reactions and allow carbon transport to the core-mantle boundary. Michael Broadley (Centre de Recherches Pétrographiques et Géochimiques, France), and Peter Barry and Chris Ballentine (both at the University of Oxford, UK) suggest in a new paper in Nature Geoscience that the eruption of the Siberian flood basalts caused a massive halogen release to the atmosphere, which may have kicked off the largest mass extinction in Earth history. In a paper in the Proceedings of the National Academy of Sciences, Kelly Wrighton, Michael Wilkins (both at Colorado State University, USA), David Cole, Julie Sheets (both at The Ohio State University, USA), and colleagues present coupled laboratory and field investigations that explain how microbial communities persist in hydraulically fractured shale at the elevated temperature, pressure, and salinity found 2500 meters beneath Earth’s surface. We are seeking nominations for the 2018 DCO Emerging Leader Awards, which recognize early career scientists for distinguished performance and unique potential as leaders of the deep carbon science community. Please submit nominations by 28 September. It’s a great way to recognize the early career researchers who have made exceptional contributions to our community. And last but not least, DCO released a new video on the Oman Drilling Project, featuring stunning footage of fieldwork in Oman as well as interviews with DCO scientists Peter Kelemen (Lamont-Doherty Earth Observatory, USA) and Alexis Templeton (NASA Astrobiology Institute, USA). Please don’t miss it! Did a Burst of Halogens Kick Off the End-Permian Extinction? A Behind-the-Scenes look at "The Most Unknown"
The conference is a joint outreach meeting between three European networks; CarbFix (collaborative research project led by Reykjavik Energy, that aims at developing safe, simple and economical methods and technology for permanent CO2 mineral storage in basalts), S4CE (Science for Clean Energy) and MetalAid (Horizon 2020 Mare Sklodowska Curie Innovative Training Network), and the Deep Carbon Observatory and CarbSafe (study evaluating feasibility of collecting and storing carbon dioxide in a safe, ocean basalt reservoir offshore), and includes the DCO workshop, "Catastrophic Perturbations to Earth’s Carbon Cycle" from 10-11 September. Extremophiles 2018 aims to show the updated state-of-the-art of research on basic and applied aspects of life in extreme environments and to stimulate high quality research, inspiring those already working in the field and young scientists interested in studying extremophiles. The meeting will serve as a platform where participants exchange ideas on progress in deep exploration of the lithosphere, to better understand deep processes in Earth, expand the new knowledge into practical applications, consider the future, and promote international collaboration on deep exploration of Earth. 2 August 2018 Why are some diamonds blue? Scientists have new evidence from inside the stones.